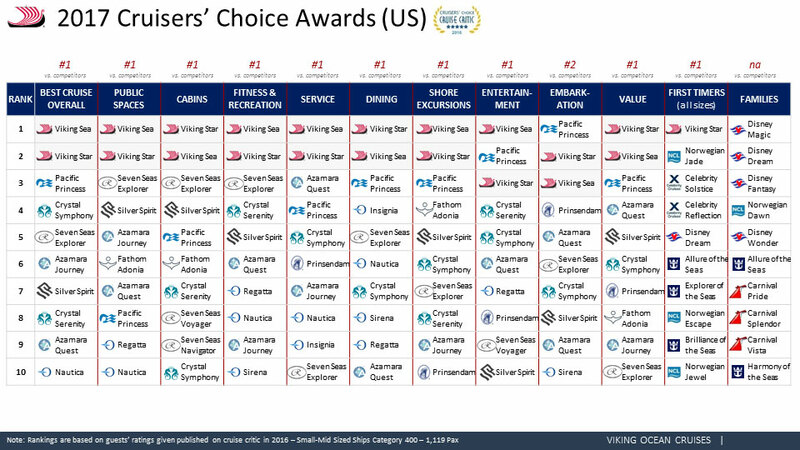 Los Angeles (February 16, 2017) – After another year of impressive travel industry awards, Viking Ocean Cruises® (www.vikingoceancruises.com) this week received a new set of accolades from the popular online cruise resource, Cruise Critic®. The fast-growing cruise line is today celebrating that its 930-guest sister ships, Viking Star® and Viking Sea® , received top honors in ten categories in the Small-Mid Size (400-1,199 passengers) class of the Cruise Critic® 7th Annual Cruisers’ Choice Awards. Two Pool Choices: In In addition to the Main Pool with a retractable roof permitting any-season swimming, the ships feature a first-of-its-kind glass-backed Infinity Pool cantilevered off the stern, allowing guests to swim surrounded by their destination.